Bazaars are the beating heart of every city in Iran. A visit to the Grand Bazaar in Tehran is bound to overwhelm your senses with the smell of spices, sights of colourful Persian carpets, and friendly smiles. Iranian bazaars are more than a place to shop for souvenirs; each one is uniquely designed with mosques, tea houses, bathhouses and traditional restaurants where you can spend a good couple of hours. Vakil Bazaar in Shiraz, Tabriz Bazaar and Isfahan Bazaar inside UNESCO-listed Naqsh-e Jahan Square are arguably some of the most architecturally beautiful bazaars in the country. To experience the flavourful and aromatic food of Iran, make your way to traditional Iranian restaurants or better yet, Persian homes. The culinary delights of Persian food are endless, elevated by coveted ingredients including saffron, pistachios, cardamom, turmeric and rosewater—which are native to Iran. One of the most divine Persian dishes is tahchin, which is layered saffron rice mixed with yoghurt and chicken, and served with a golden brown, crunchy rice crust facing up. Another must-have is dizi, or abgoosht, a hearty Persian stew served in a stone pot, and consumed with ritualised steps which adds to the cultural experience. If you must get your kebab fix, try chelo kebab koobideh, which is ground beef or lamb mixed with parsley and chopped onions paired with saffron rice. 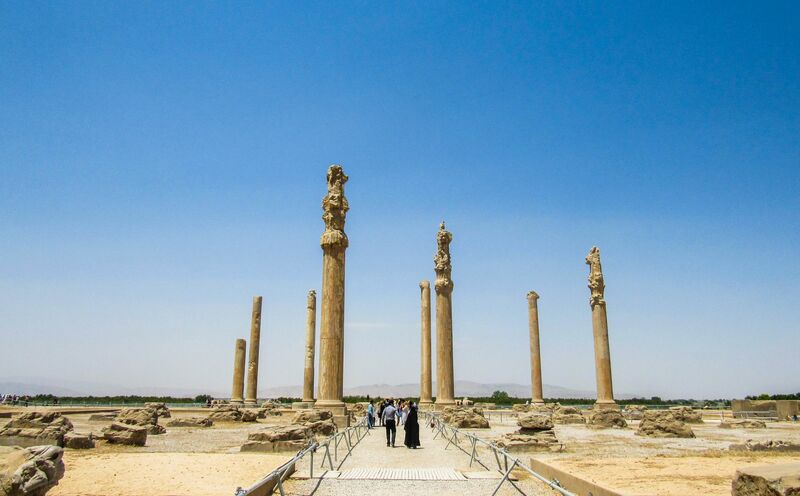 A trip to Iran is not complete without a visit to Persepolis, which is only an hour drive from Shiraz. The First Persian Empire was once one of the most powerful empires in history, and its capital, Persepolis, remains as a symbol of its glory today. From the grand staircases, pillars and carvings of the palaces, the remnants of this royal city are marvelous to behold and offer a rare glimpse into one of the world’s most ancient civilisations ever existed. The city of Kashan, also known as the city of rose, produces an average of 30,000 tons of rose water per year, making Iran the top exporter of rose water in the world. The best time to visit Kashan is mid-May to mid-June, when the Festival of Rose and Rose Water takes place and the pleasant scent of rose fills the air. But Kashan has much more to offer than roses. If you get the chance to spend some time in the city, make sure to visit Fin Garden, Sultan Amir Ahmad Bathhouse and Bazaar of Kashan to soak up some history and the beauty of Persian architecture. The desert city of Yazd in central Iran is an UNESCO World Heritage Site that offers a rather unique experience compared to other cities. Here, be prepared to get lost in the charming mud-brick old town, learn about Zoroastrianism in the Zoroastrian Fire Temple, and go rooftop hopping for some unforgettable views. If visiting between March and June, take a tour to Bafgh Desert just half an hour from Yazd, where mesmerizing sand dunes, wild camels, and starry sky await. While the classic route from Tehran to cities in the south—often Isfahan, Shiraz, Yazd and Kashan—offers an eye-opening introduction to Iran, the northwestern part of the country is a hidden gem that only locals know. East Azerbaijan Province boasts some otherworldly landscapes that you won’t find anywhere else in the world—notably Eynali, a colourful mountain range in Tabriz, while the Gilan Province is home to Masal County, a heaven-like scenery where some of the country’s best waterfalls, caves and forests that will make your jaw drop. The grandeur and details of the mosques in Iran are unlike any you’ve seen before, and each has its own distinctive design that turns a place of worship into a piece of art. Nasir-ol-molk Mosque (aka the Pink Mosque) in Shiraz is one of the most stunning and photographed pieces of architecture in Iran, known for its stained glass which reflects gorgeous patterns on the floor covered in Persian rugs when the sun shines through. Tatler tip: The best time to visit is in the early morning, and female travellers can borrow a chador (a full-body garment) before entering the mosque. Iranians love picnics—it’s their way of enjoying the outdoors and spending time with family and friends. The food variety in an Iranian picnic can range from salads, kebab, stews and desserts, but the must-haves are chai (tea) and naan (bread). If you can tag along with the locals for a picnic, it’s likely you'll end up enjoying your feast at an incredible spot in a forest, near a lake or on a mountain. The architectural wonders of Iran may evoke ancient ruins, mosques, bazaars and gardens, yet little is known about the historic villages—the least-explored corners of the country where traditions of a bygone era nestle. If you’re in the Isfahan province, make time to see Abyaneh, a 2,000-year-old village where women wear abyanaki costume (a white long scarf with floral print) and speak a dialect that has elements of the Middle Persian language. The best time to visit Iran is during Nowruz—aka Persian New Year—which starts on the first day of the Iranian calendar around March 21 and lasts for 13 days. Every household starts spring-cleaning and setting up the “haft-seen” table, which consists of seven items that symbolise wishes for the new year. On the last days of Nowruz celebration, the Festival of Fire takes place and sees bonfires on the street and Iranians jumping over the fire—a purifying ritual that is symbolic of cleansing one from evils and misfortunes, and hopes for a new beginning.